India’s leading refining company Indian Oil Corp (IOC) has set up a trading desk in New Delhi to buy crude oil from international market on a real-time basis, helping it cut import bill by locking in best price and quality, its Director (Finance) A K Sharma said. 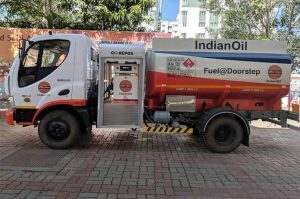 Indian Oil Corp, normally purchases 30 per cent (15 million tonne) of its oil requirement from spot or current market, had set up a trading office in Singapore in 2017 but has now developed in-house software and trading team in National Capital Region to buy crude oil on a real-time basis. It made the first purchase through the desk on March 25 when it bought one million barrel of Nigeria’s Agbami crude, he said. While private sector firms like Reliance Industries have had a local trading desk for buying of crude and exporting fuel it produces, IOC would be the first state-owned refiner and public sector company to arrange this type of trading desk. Sharma said the Singapore desk was used to buy crude oil on a short-duration basis where the purchase was decided in two-hour time after receipt of offers from an international seller. This is compared to 10 hours taken to decide on purchase in traditional tenders. But with a trading desk at its office in the national capital region, IOC is deciding on purchases on a real-time basis, he said. “This helps us get the best price and most suitable, value giving crude,” he said. In traditional tenders as well as short tenders floated through the Singapore office, IOC would seek quotations from international sellers for a particular grade and quantity of crude oil. It would decide on the price based on the lowest bid rate with no scope of any negotiations on the offer. However, with the trading desk now, it on a real-time basis bargains with crude merchants, often negotiating price of one with another to get the best rate. IOC plans to transfer the trading desk once it stabilises in Singapore to do the real-time purchase of quantities of crude oil it buys from the spot market. Also, it could trade on fuel its refineries would export, he said. The company buys about 70 per cent of its crude needs from oil companies such as Saudi Aramco of Saudi Arabia and SOMO of Iraq on annual term contracts. The rest is bought from the spot market through tenders. Sharma said ultimately most of the spot purchases would be done through the trading desk. He, however, did not give a timeframe for moving to that. Currently, one cargo of 1 million barrels are bought through trading desks at Singapore or at New Delhi. Sharma said IOCL Singapore Pvt Ltd – the company’s Singapore subsidiary – will ultimately handle the trading desk. Singapore is the best trading hub for the world’s biggest consumer region and an office there will help it have better access to information and quick decision making. Before 2017, public sector oil companies would often lose out on opportunities to buy cheaper crude from the international spot markets as their sourcing policies required them to float a tender and obtain regulatory approvals from the oil ministry department before they could place an order to buy. Prior to that, IOC used to take 26 hours to decide on a tender for import of crude oil from spot or current market. In April 2016, after the Cabinet gave state-owned oil refiners freedom to formulate and design their own crude import policies and execute on a real time basis.